From time to time a change, in one or more comic book hero's powers, occurs. There can be a multitude of reasons behind this. Has the comic book hero become stagnant? Has the readership declined over the past several months? Did a metamorphosis happen while fighting? Did a depletion of their power make room for the change? And, of course, the ever-popular experimentation. A mad scientist creates an experiment, an ordinary individual gets in the way, and his or her DNA is altered. He or she is then morphed into a superhero or a criminal based upon their disposition. Another version of that is a comic book superhero or villain get in the way of an unsolicited experiment that went awry. Their molecular structure is mutated, which begs some questions. Does an ordinary citizen receive powers? Do the superheroes or villain's powers stay the same? Do they exhibit the same powers, only augmented? Do their powers change until it is unrecognizable from the original? Is the change a temporary one, or is it a long-term modification? Will their powers ever go back to normal? These issues are explored and examined, sometimes in minute detail. The details that go into explaining the ever-changing powers of comic book heroes are appealing. In the framework of comic books, where fantasy merges with the imagination, the predicaments in which precipitates the change of the powers suggest that the storyline was born, bred and raised for some time. Superman's powers changed him into two separated beings. One being was red and the other being blue. Each one was a separate hero who displayed different characteristics. They eventually combined and recreated the Superman we are familiar with and love. The account took one year. The semantics of the change suggested superman needed revamping. The mighty Thor has seen his share of transformations. He possessed the Odin power for a while. Thor has his share of problems and will continue to so because the readership can relate to his problems or vices. With Superman's changes, the reader is confronted with Superman's problems and can debate the best way to handle them. Many more comic book heroes have had their power altered in some way. It seems to be a staple in the comic book world. Amending a superhero is necessary for that type of environment. Introducing nemesis's and other comic book heroes perpetuates the genre. Moreover, if there were no further introduction of contrasting characters, the storylines would fizzle up and new ideas could not germinate. It is therefore sometimes essential to introduce old comic book characters with a twist. They can come back from the dead, or believed to be dead, and emerge to take on a criminal. It has to make some semblance of the discerning comic book reader. If the hero returns under circumstances that would seem suspect, the public response would be swift and ruthless. People expect some sense in the comic book world. The ever-changing power of comic book heroes advocates a winning attitude for the comic book reader and the people who create them. When the two parties are in unison both sides win and the reader is left with a palpable appetite for more. Robin and Hawkman were some of the heroes that a new company called Detective Comics or DC comics, launched. During the 1940's a precursor to Marvel Comics, called Timely Comics, introduced their version of the super hero genre. They included Captain America, The Human Torch and The Sub-Mariner. Ironically, the Captain Marvel comic books from Fawcett Comics outsold Superman and his associates during the golden age. There were literally hundreds of super powered and non super powered heroes that came and went. 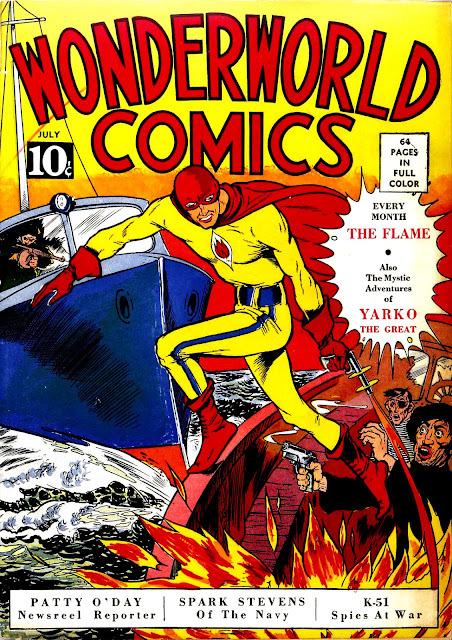 The advent of world war two helped propel the comic book industries popularity. It was an inexpensive means to relax, read and imagine the good guys prevail over the bad guys. In those days, Superman regularly helped the allies thwart Hitler and the axis powers. What better way to defeat the enemy than to watch the heroes in action? Defeating Hitler was on everyone's mind, and the stress relief comic books provided was helpful to a young man in a foreign land engaged in daily battles. Superman, Batman and Robin helped the war effort by advertising war bonds. Uncle Sam may have wanted you, but the super heroes lending themselves to the war propaganda helped the cause. Which one was more influential in the golden age of comic books: a sickly looking old man who wanted you to fight, or young powerful super heroes that could do incredible damage to the enemy? The answer is evident. The war was significant and powerful in the development of the super heroes during the golden age. However, there were other factors too. There were comic books during that period that were not based on super heroes. The genre started to change during the latter part of the golden age, especially after World War Two. Westerns were taking firm root in society as the readership declined for the super heroes. Horror, romance, satire and science fiction all filled the vacuum that was left during the decline. The downward trend was precipitated by, in my opinion, the ambiance of the times with McCarthyism and books being published that suggested comic books and their ilk were detrimental to the society's young people minds. The introduction of the funny comics during the golden age were well-liked too. Bugs bunny and Donald duck premiered. The funny comics instilled laughter in the audience and that was important. The importance of laughter during stressful times cannot be overstated. The atmosphere was rife with the arrival of the cold war and the atomic age. Bomb shelters littered the country. With that being said, the funny comic books helped people express amusement in their daily routine. Whatever genre people chose to read, the Golden Age of comic books influenced the shaping the comic book market. Heroes and villains in comic books have made their mark in society. Not just in comic books but in literature throughout the ages. Essentially literature and comic books bring to life the drama associated between good and evil, and it is that premise that becomes an indispensable guide to understand human nature. In a nutshell, you will not know evil if you have never experience goodness. The antithesis holds true. If you never experienced good, you have never experienced evil. In comic books, the heroes and villains try to ante up the stakes by pitting their resources against one another for the sake of besting the other. The heroes usually come out victorious but criminals can be just as successful. If the heroes always won, it would make comic books dull and uninteresting. The villains have to be counted on to cause ruckus and mayhem otherwise; the storyline does not coincide with a balance that must be struck. Today's comic books have smarter criminals, weaponry that is more sophisticated and more behavior that is aggressive. Does this make the hero more steadfast in his or hers reaction to the villains aggressiveness? It depends on the hero. You do not have to possess superhuman powers to outsmart a villain. In today's comic books, a hero can employ a great deal of cunning to outsmart a villain. The comic books of today offer a recipe for the balance of power. A villain usually takes on a key role and if the hero does not thwart the diabolical plan, the hero may lose confidence. In that vein, the comic book looks at the human condition. Why was there failure? What could have prevented the villain from escaping? With the loss of self-belief, the hero of the comic book must take necessary steps to assure success or the villain, sensing something amiss with the good guy, can utilize plans that are even more ambitious. With the balance askew for the time being, the hero must reassert his or her authority to impede the villains plan. The hero does not have to be in the superhero genre. It could be any comic book that pertains to the right or wrong in making a decision. Heroes and villains in comic books enable the reader to make choices, and within that framework, can get a better understanding of what both the villain and the hero had to do to succeed. However, success is only a temporary distraction. It permits a continuation of the story. So then, who is really the victor and the loser? If both hero and the villain continually face off against one another, where and when will it end? Quite possibly nothing short of the demise of one or the both of them. Perhaps the villain may go to jail, but eventually he or she will be released and the comic books prevail. There is clearly no winner or loser. The only winner will be found out in the next installment. Moreover, the only loser is the person who does not read the next issue. Comic books are important because they represent a segment of the population that like to fantasize that they can escape the hardship of everyday life. In comic books they can be the hero, the nemesis, or a third party that may or may not become pivotal in the end. A person may identify with a certain character because the personality the superhero or villain embodies what the person visualizes, or identifies with. Comic books are important because the scenarios that the people face exhibit situations where confrontation isn't necessarily the only answer. The quandaries faced enable a person to see a situation and how it is dealt with. Comic books allow people to create their own versions and see how different scenarios are played out, which can result in new ways of defusing stressful situations. It may permit a person to see situations in life differently and hence; think outside the box when warranted. Comic books are important because the venue in which they are supplied is an alternative to regular book reading. They are shorter in length so a person who is more visual will get additional enjoyment out of a forty-eight page comic book versus a short story or a novel. It would be less time consuming and allow the reader to engage in other activities. Time management and comic books are synonymous in the vein of everyday life. People seem to have little time to read. The busy lifestyle, the children's needs, all those requirements play a role in time constraints. Comic books offer a solution to the active person. The reader is limited in time so he or she must be enthralled immediately to gain full attention. Once the reader immerses himself or herself, the ambiance changes. He or she is thrust into an unknown situation that demands total attention. The plot thickens and the hero is cast in circumstances that demand a resolution. The confrontation ensues and against seemingly impossible odds, the hero finds an answer in an unlikely place or person. Once the comic book is finished being read, very little time had elapsed. Yet the reading of the comic book doesn't end there. The reader now has time to dwell on what transpired, what could have been done, what should have been done and a myriad of other possible outcomes. That can be done while daydreaming or at a quiet time when you're alone. The significance of contemplating the different endings of a comic book induces thought. The what if landscape could produce an unexpected epiphany. It might help with a problem that had eluded you and the answer to your dilemma was spelled out. You might have to apply it differently than the comic book did, but the answer could have been contained within the story. Comic books are important because people need them for an outlet. It channels our thoughts to construct a better picture of how we need heroes to behave, and what limits we set upon them to handle crisis that inevitably happens. You could argue that delving into the importance of comic books is inane. But looking at the bigger picture and what comic books represent, I would argue the reciprocal.